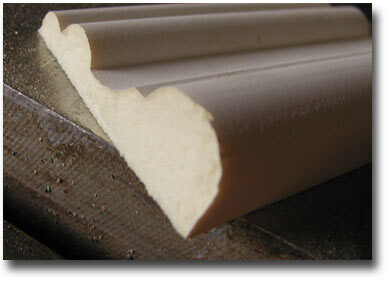 View the Polyurethane Crown Molding department. The most common question customers have about our moldings is “What is Polyurethane?” The term is often confused with polystyrene (a.k.a. styrofoam) but the material is quite a bit different. Polyurethane is a dense foam material that has all of the advantages of wood without the disadvantages (rotting, splintering, and cracking). 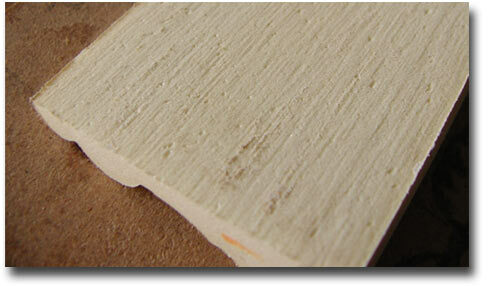 Let's take a look at why polyurethane is a superior material to install. Lightweight and easy to install (Learn: How to Install Crown Moulding). 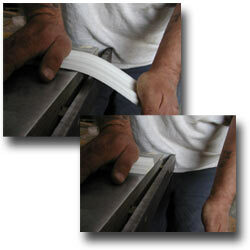 The picture to the left is of the saw blade used to cut through this piece of moulding. You can see that it has a pretty coarse blade on it, but cuts through the moulding with no drama at all. "So how tough is the polyurethane moulding?" Another question we get a lot, so we got Pete to help us out and demonstrate what happens when PU moulding is pushed to the max. The first picture (right) is a split second before the piece broke in two. If you knew how big Pete is you'd know that the poor moulding didn't stand much of a chance, but it put up a pretty good fight before it broke. Notice the amount of deflection in the part. Below is a picture of the broken end. You can see that the part failed in a straight line that runs parallel with the table edge. The moulding is one solid piece and does not shatter or splinter. In this photo we can see the back side of the moulding. 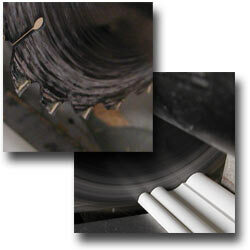 The rough and porous surface allows for adhesives to bond to the PU.